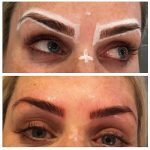 When you've tried every pencil, powder, pigment, gel, and stencil at Sephora and your brows are still sparse, microblading—a more permanent solution to thin brows—is the last-resort treatment that promises to change your brow life. If you drink a lot, take aspirin, or use retinol, stop one week before your treatment. "Retinol makes your skin thin and then you bleed a little more, Avoid blood thinners, aspirin, and alcohol." Pain is relative. "Some feel more than others. Overall it feels like little scratches. You feel it, but it's not unbearable. 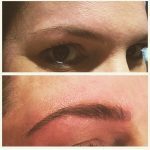 It's not like having a baby," I like to prep patients' brows with topical numbing cream and top up throughout the process to dull the discomfort. That means protecting freshly bladed brows from all moisture–no sweaty workouts or washing your face with water. Some patients experience itching and redness during the first week, which Vaseline can alleviate. Brows will look slightly darker at first, but the color will fade 30 to 40 percent. Aftercare ointments are provided during your first appointment. "Overall they look great right away and you don't have to hide," Slight redness and mild swelling is normal. Depending on the skin and lifestyle, Lucy's clients come back for touch-ups once every six - twelve months. 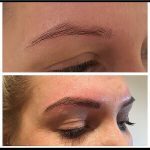 The first treatment can cost up to £300 (including top up) £250 for regular brows (including top up) While lower-priced services are available, Lucy cautions against visiting inexperienced technicians. 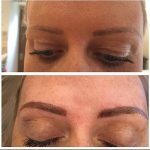 Remember, microblading is a form of tattooing. Lucy Takes a minimum of 2 hrs to perform treatment as so to get your treatment just right for you.